Carrot Halwa: Carrot Halwa or Gajar Ka Halwa is a sweet dessert pudding associated mainly with the state of Punjab in India & Pakistan. It is made by placing grated carrot in a pot containing a specific amount of water, milk and sugar and then cooking while stirring regularly. It is often served with a garnish of almonds and pistachios. The nuts and other items used are first sautéed in ghee, a South Asian clarified butter. It is traditionally eaten during all of the festivals in India, mainly on the occasion of Dewali, Holi, Eid al-Fitr and Raksha Bandhan. The Gajar Ka Halwa is served hot during the winter. Set the roasted cashew nuts aside for the garnish. Boil the milk on medium-high heat in a non-stick pan, till the milk is reduced by half. Stir often to ensure the milk does not burn in the bottom of the pan. Stir-fry for about seven to eight minutes. Cook the carrot until the milk dries, takes about eight to ten minutes. Add in the sugar and cardamom powder. Stir-fry for another three to four minutes or until the carrot halwa starts to leave the side of frying pan. 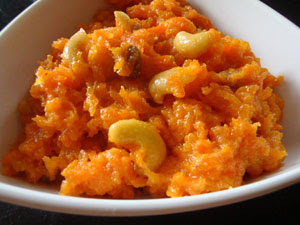 Garnish the carrot halwa with cashew nuts. Carrot Halwa can be refrigerated for up to one week. To serve, warm it in a microwave. Cook the carrot halwa a little more and pour on a greased plate. Spread the halwa until it is flat and 3/4 inch thick.After the halwa cools, cut in squares. Garnish with cashew nuts or almonds slivers.